The International Medieval Combat Federation was formed in mid-2013 as a result of dissatisfaction felt by members of many national teams with the HMB organisation. This was mainly to do with lack of a voice in how the sport was progressing and several other factors that have now been largely resolved in the intervening time. The formation of the IMCF was based on the idea that no one nation would have veto or control over the sport and that each participating nation would have one vote which could be cast to determine how a matter could be resolved. It is administered on a voluntary basis by a series of committees consisting of nominated members from each participating nation. The founding member nations of the IMCF are: Poland, Germany, USA, Great Britain, Denmark, Italy, Spain, Portugal, France, Luxembourg, Quebec, Ireland, Japan, Latvia and Belgium. Later member nations include Australia, New Zealand, South Africa, Mexico (list incomplete). The inaugural IMCF World Championships was held in May 2014 at Castillo De Belmonte in Spain, 150km from Madrid. 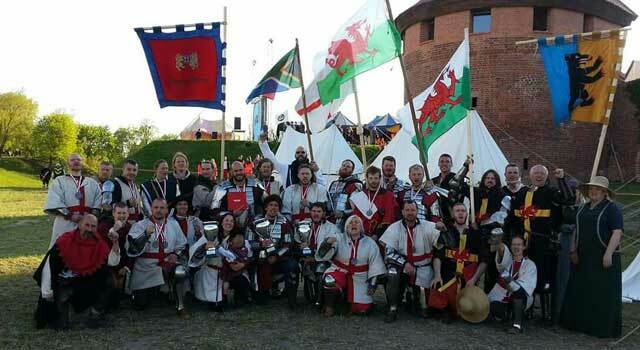 Over the course of three days over 30,000 spectators watched fighters from 22 countries participate in 5v5, 16v16, and 1v1 tournaments with categories in Sword and shield, Longsword, and Polearm. For the first time ever female competitors took part in 1v1 combat. Battle Heritage reached the quarter finals in the 5v5 and Silver in the Male Longsword was won by Lukas Kowal. The following year, 2015, the event as held at Malbork Castle, near Gdansk in Poland. The IMCF decided that due to an increase in interested nations, each country could only field one team in each category. They also added the 10v10 class to enable smaller national teams to compete in larger battles even if they could not gather a team for the 16v16 events. In 2015, Battle Heritage won Silver for 5v5 and 10v10, losing only to the home Nation Poland. Our women’s team also took out silver in the inaugural 3v3 competition. Lukas won silver once again in the Sword and Shield category and on his debut at the world championships, Pawel Kurzak won Gold in the Polearm after an epic seven rounds (normally best of three) with Jose Martinez Amoedo from Spain. 2016 saw Battle Heritage return to the IMCF again, this time at the stunning Montemor-O-Velho in Portugal. This was the team’s best year to date, with gold medals in four events and silver in one. The men’s 5v5, 10v10, men’s polearm duel and men’s longsword all went to Battle Heritage- with Lukas Kowal adding to his prizes the men’s sword & shield silver medal. Every event Battle Heritage entered saw us bring home a medal. As a team Battle Heritage continues to grow and improve year by year, and we look forward to tackling the challenges of 2017 head on.